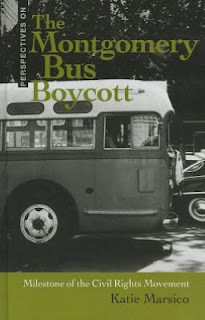 Perspectives on the Montgomery Bus Boycott: Milestone of the Civil Rights Movement by Katie Marsico. On December 1, 1955, Rosa Parks refused to give up her seat on a bus in Montgomery, Alabama, unknowingly setting off the spark that led to the rise of the Civil Rights Movement. With an in-depth look at the people and events surrounding the Montgomery Bus Boycott, Marsico provides young readers with a deeper understanding of this one small incident, and the role it played in the larger Civil Rights Movement. Citing interviews with those involved, as well as news articles, police reports and legal documents of the time period, Marsico explores the perspectives on both sides of this volatile issue. Marsico carefully presents the facts of the events in a fair and unbiased manner, so that readers can truly understand the complexities of the Civil Rights Movement. A detailed bibliography and list of resources for further study will lead the reader to discover much more about the movement than he (or she) ever knew before. I didn't know, until I read this book, that Rosa Parks wasn't the first black person in Montgomery, Alabama to stand up to a bus driver when ordered to give up her seat to a white passenger. I didn't realize she was deliberately chosen to be the face of the boycott. I didn't realize that the organizers of the boycott originally weren't seeking to spark a nationwide movement toward civil rights. They simply wanted fair treatment on the public transportation in their own city! The wonderful thing about it all is that they didn't back down. They didn't give up when the going got tough. They kept moving forward, in the face of great persecution and threats to their personal safety, and because of their courage, the world is a little bit better today. Here's to all the heroes - black, white, green and purple - who have the courage each day to stand up in the face of prejudice and bigotry. Here's to all the heroes - famous or not - who stand up tall and proclaim: "We are all children of the same Heavenly Father. We are all immensely valuable to Him. And as heirs to our Father in Heaven, we all deserve to be treated with love, respect and kindness. Superficial qualities are not important, because the Lord doesn't look on appearances. He sees who we are inside!"